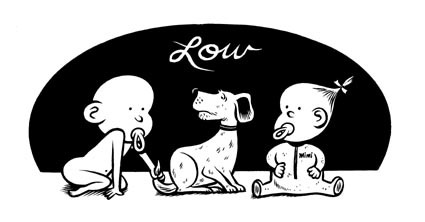 From Everett True's UK music mag, Careless Talk Costs Lives, illustrating an article about Low, wherein the author says he's going to name his two children and dog after the members of the band. The dog is kind of ripped off from Crockett Johnson's "Barnaby," as part-laziness/part-homage to bass player Zak, who is a fan of the strip. Smallish, about 4" x 6". If you just like the illustration and don't care about the band, I can always just blacken in the logo. Hell, I can change it to Loverboy if you want.